Oh, Amazon, you know how to sell tons of those 7-inch Fire tablets, don’t you? The Amazon Kindle Fire refurbished is now selling for a mere $139, making it an almost impulse purchase. This is a one-day special on Amazon Gold Box and it comes with a standard one-year warranty. 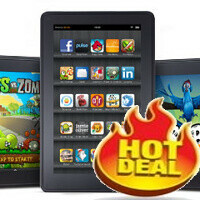 At $139 for a recertified refurbished tablet, you get $30 off the standard price of $169 for a refurbished Kindle Fire. And while the 7 incher is far from being able to compete with the iPad in pure functionality, you can get four Kindle Fires for the price of one iPad and still have spare money. Not a bad deal, is it? There’s only 17 hours left until the deal expires or until Amazon runs out of Kindle Fires, so you’d better hurry up and hit the source link below to buy it.